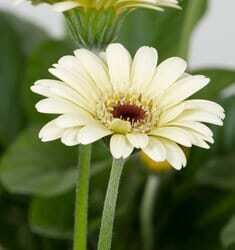 Vigorous and hardy with a profusion of daisy-like soft buttermilk colored flowers with darker centers. The medium sized flowers top sturdy stems above a rosette of dark green foliage from spring until the first frost. The Drakensberg series are bred to thrive in full sun, intense heat and humidity and are incredibly disease-resistant.